I have gained my magical knowledge during many travels to different parts of the world: by voodoo masters in Africa and South America and by Mages in Europe. I have been trying to forward my knowledge further almost 40 years. I offer my clients and my students meditation courses, seminars about tarot reading and also seminars about white magic and voodoo. Such seminars provide participants with information necessary for their successful magical practice, especially how should one work with his/her inner self. Nobody can make a mage from you, you have to exercise, try different approaches and gain your own experience. In white magic it is sometimes necessary to perform a ritual precisely, with the same words and even finger positions like a master hundreds years ago. But another time you have freedom to decide how and what you will do and in this space you have to find your own style of work. My experience has shown me, that adepts should perform rituals according to their personal way of thinking and internal belief. Every Student or Mage is different. One is attracted by traditional way of doing rituals, for another works Chaos magic very well. It is ok. Find and accept your inclinations and preferences and do a ritual in a way, which feels right and strong for you and makes you feel confident. You have to be the Authority. You have to find a way, how to create you authority and power over your ritual. For this purpose, you should use in your ritual the analogies and symbols, which represent your desire and support it. Each object, which is present in your ritual, should have for you some deeper meaning. I have experienced that many people try to cast a spell, but they don't take into consideration the Law of Analogy and therefore spell doesn't work! We take an example of love spell. One man wanted to perform a love spell. He had instructions how he should proceed. In the instructions was written that it is needed to have candles of certain colour (Love belongs to Venus and therefore are needed green candles). But this man didn't want to trouble himself with looking for green candles. So he used candles he had at home, even in wrong colours! He was then surprised, that his ritual had no effect at all. One cannot cast a spell successfully, if he/she doesn't take into consideration the Laws of Analogy! Another big mistake people usually do is, that they don't pay proper attention to creation of a magic circle. Many people simply don't concentrate properly on circle and that means also on protection. Their attention is shallow and can be disturbed from the main focus easily! To make a circle properly, one should use salt or draw it with chalk and concentrate strongly on the purpose of the circle: to protect inner sacred space from bad or evil energies, which want to use the ritual for their purposes or/and eventually to do a harm to a mage. The properly made circle will prevent them to go in and they stay outside! So, one has to concentrate on drawing as strong as possible! One has to be sure, s/he is really safe. Nothing and nobody shall divert your attention and interrupt you! My experience has proven, that it is necessary to have a magical note-book, where one should record every success, failure, important night dreams and personal wishes. Such a note-book will help you to identify and evaluate what the certain dream means, which performed rituals were successful, which were not and what can be improved. The practical experience with magic and meditation is as important as theoretical knowledge and guidance of some Master. If you want for example to know about swimming, it is sufficient to read some books about swimming and water, to speak with somebody who can swim. But if you want to learn it, you have to try it of your own. And if you want to learn it professionally, you would probably seek the guidance of a professional swimming coach. Magierin Damona experience: please read here testimonials from our clients. You can see also answers to clients' frequently asked questions. 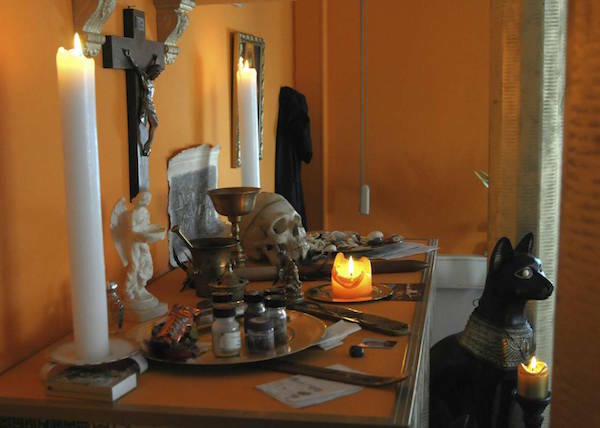 Everyone is most welcome in our White Magic Centre in Germany, Kassel. Here you can enjoy professionally guided meditation, find out more about what white magic is, let us to read for you tarot cards and counsel you what steps should be taken. Do you have a problem to make a decision? Don't you know what should be your next step? Can't you predict the consequences of your action? We will help you in the process of decision-making. Try to imagine how many things you would do differently, if you knew their consequences beforehand?